Reliance JIO 200% Cashback Offer : Every time Jio Trending in india’s Telecom History. Now Cameup with JIO 200% Cashback offer up to Rs 799 on recharge of Rs 399 and above recharge. Lets check procedure of How to get 200% cashback offer from below article. JIO Recharge Rs 399 Offers 200% Cashback Offer Up to Rs 799 – How to Available this Offer? Jio Exclusively Offers 200% Cashback in February for JIO Prime Members. Every people having doubts that how can we avail this offer and where should we recharge. Lets give you brief explanation guide on Jio Recharge cashback offers. 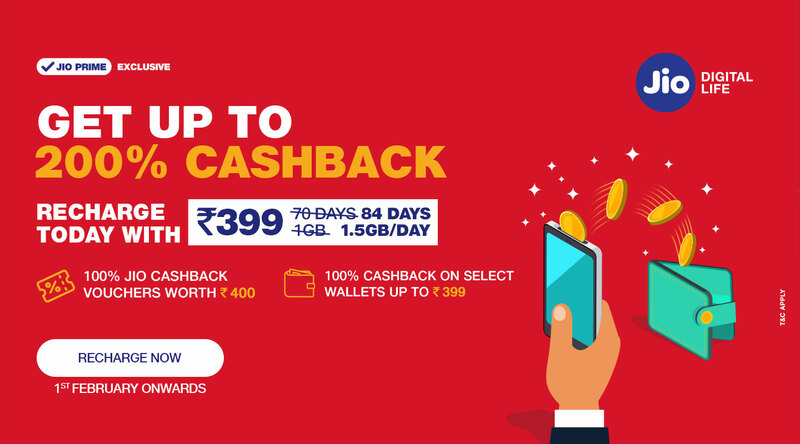 Under this Offer People who Recharge 399 or Above can get 100% Cashback vouchers of 8 worth 400 Rs will be Credited to Myjio Account and Remaining 399 Rs Cashback will be get into Selected wallets. if you recharge with Mobiwik Wallet, can get Total 799 Rs cashback. What is the “Get up to 200% Cashback offer”? Where can we check the status & “Get upto 200% Cashback” vouchers? You can check the status of the 100% cashback vouchers of Rs.400 (Rs.50*8) on MyJio app under “My Vouchers” section. The balance 100% cashback is subject to recharges done via Third Party Aggregator apps/ websites. Upto Rs.399 cashback is offered on selective Third Party Aggregator wallets. This gets credited instantly and can be checked on the respective Third Party Aggregator wallet app / website. You Can Transfer the Cashback Vouchers From your wallet to your friends wallet. 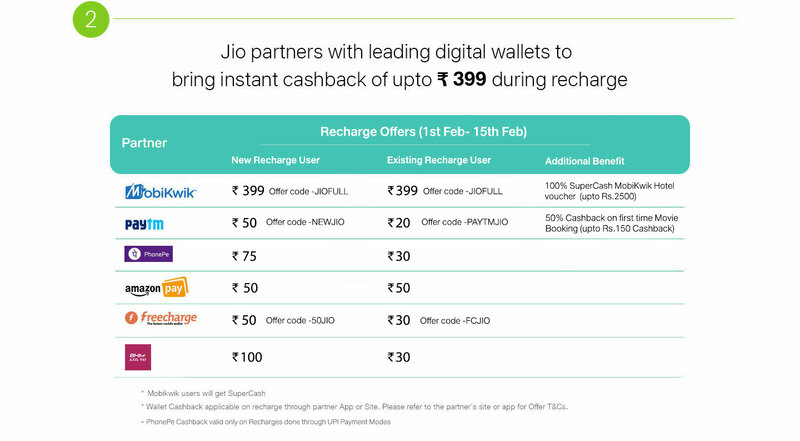 We can Recharge of Rs 399 and Above From Jio.com, Myjio App, Reliance Digital Stores and From below Wallets like Paytm, Mobiwik, Phonepe, Amazon Pay, Freecharge etc. You can use Previous cashback vouchers also to do get this recharge plans along with 200% cashback. Note : If you have any doubts regarding above post or related to jio, Can Ask in Below Comment Section. We will happily answer for your queries.